Providing you the best range of Pallet Truck such as Hydraulic Pallet Stacker, Stainless Pallet Truck, Patel Pallet Truck, Electric Pallet Stacker, Low Profile Pallet Truck, Hydraulic Hand Stacker, Beam Lifting Trolley, Stainless Pallet Truck, Pallets Trucks, Beam Pallet Truck, Hydraulic Hand Pallet Truck, Hydraulic Truck, Low Profile Pallet Truck, Pallet Jacks, Pallet Truck, Hydraulic Truck, Pallet Jacks, Bag Stacker and many more items with effective & timely delivery IN Naroda G.I.D.C., Ahmedabad, Gujarat, India. Supplier and manufacturer of Stainless Pallet Truck, hydraulic hand pallet truck such as 900mm hand pallet truck, 3000mm hand pallet truck, hand pallet trucks with cast iron wheel, hand pallet trucks with nylon wheel and with polyurethane wheel. Patel material handling equipment uses single piece bent forks for extra strength. Hand lowering is the key to productivity. Pull the convenient lever in the pmhe-102 large steering handle and effortlessly deposit the load. The special handle design offers protection for the operator's handle and makes raising loads and steering easier. Release the handle and it returns to vertical. A few strokes of the handle provide 110mm of lift, the PMHE-102 heavy-duty pump is built to take thousands of pick-up and deposit cycles. The pump 'top-of-stroke' hydraulic fluid bypass minimizes stress on the system when the load is raised to maximum lift height. We are instrumental in putting forth a wide array of Pallets Trucks that is designed to ensure the complete safety of the material during transit. These trolleys can lift the heavy beams of up to 1500 kgs. and are manufactured in compliance with the defined industry standards using quality raw material. We are instrumental in putting forth a wide array of Beam Pallet truck that is designed to ensure the complete safety of the material during transit. 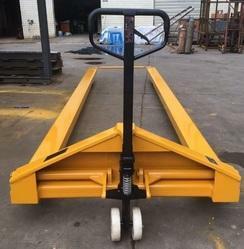 These trolleys can lift the heavy beams of up to 1500 kgs. and are manufactured in compliance with the defined industry standards using quality raw material. We are manufacturer of Hydraulic Truck, hydraulic hand pallet truck. 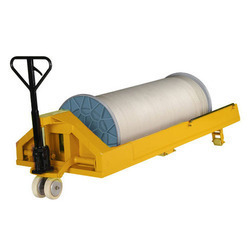 We also offer drum lifter, drum lifter & drum lifter.We are manufacturer of hydraulic hand pallet truck. We also offer drum lifter, drum lifter & drum lifter. Release the handle and it returns to vertical. A few strokes of the handle provide 110mm of lift, the PMHE-102 heavy duty pump is built to take thousands of pick-up and deposit cycles. The pump 'top-of-stroke' hydraulic fluid bypass minimizes stress on the system when load is raised to maximum lift height. The system is simple, needs no adjustment and is reliable in operation. 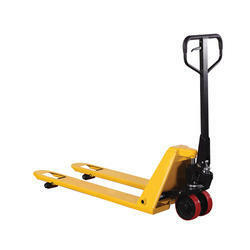 Our product range includes low profile pallet truck. 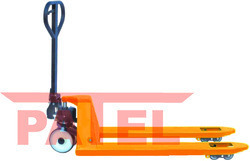 We are leading manufacturer of low profile pallet truck from India. Established in 1993 we are a leading manufacturer of hydraulic pallet jack, electric pallet jacks. 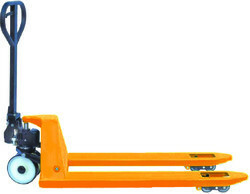 Also deals in pallet jacks from India. 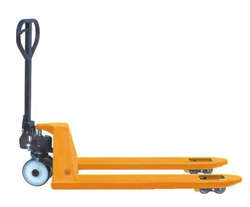 Supplier and manufacturer of Pallet Truck, hand pallet truck that includes hydraulic hand pallet truck, 1 ton hand pallet truck, 2 ton hand pallet truck, 3 ton hand pallet truck, 5 ton hand pallet truck and 900mm hand pallet truck.